Price at the pump got you down? Ditch the car and start using any one of these alternative ways to get around Denver. They’re fun, they’re social and some even may help you to get fit! It&apos;s now easier than ever to get from Denver International Airport (DEN) to downtown Denver. At a cost of $10.50 each way (with discounts available), travelers can take the airport rail from DEN to Union Station and vice versa. The trains leave every 15 minutes between 6 a.m. and 8 p.m. and every 30 minutes outside of those hours. The rail line serves eight total stations, including the new Westin Denver International Airport Hotel, connected to the airport itself. The trendy train travels on 34.8 miles of tracks from the ‘burbs to the city, making stops at 36 stations along the way. From as far south as Lincoln Avenue and east from Parker Road, trains mostly follow I-25 into downtown and beyond, with stops at Sports Authority Field at Mile High, Pepsi Center, Elitch Gardens Theme & Water Park and Denver Union Station. West of Broadway, lines extend from Mineral Ave. in Littleton along Santa Fe to points north. The train is safe, affordable and on time. Cars are clean, cool and comfortable. Nineteen stations have free park-n-Ride lots, with many stations connecting to bus stops and call-n-Ride services. Bikes can ride too, with a free permit that you can download online. Visit Regional Transportation District (RTD) for information on fares, zones, schedules, special services and much more. Services from Uber and Lyft are available in The Mile High City. If you’re a new Lyft user, enjoy up to $20 in ride credits. Simply download the Lyft mobile app, enter the VISITDEN code under the app’s “Promos” section, request a ride and you’re on your way! This is not Ralph Kramden&apos;s bus. In addition to regular bus service around metro Denver, the Regional Transportation District (RTD) bus fleet offers a slew of special rides, services for people with limited mobility, fare reimbursements, pass programs, training for frequent travelers, and free rides for active duty military. A slick skyRide makes hourly runs to Denver International Airport from 18 free park-n-Rides around the city. Riders pay fares of $7, $9 or $11, depending on location, and drivers assist with luggage. All RTD services, maps, routes, park-n-Rides and fares are detailed on RTD&apos;s excellent bi-lingual website. Called the MallRide, this free hybrid vehicle scoots up and down the 16-block tree-lined retail core of downtown Denver, also home to hotels, restaurants, office buildings, residences and public spaces. Hop on at any intersection on 16th St. between Civic Center Station at Broadway near the Colorado State Capitol (200 E. Colfax Ave.) and Union Station on the west end. A few short walks from the mall get you to the Denver Performing Arts Complex (950 13th St.) Colorado Convention Center (700 14th St.) Larimer Square (Larimer St. between 14th and 15th Sts.) Coors Field (2001 Blake St.) and LoDo (lower downtown). You can also access light rail and make connections for buses throughout the metro area and to Boulder, Golden, Longmont and Denver International Airport. Denver is one of the country&apos;s fittest cities, and this is especially true where the skinny rubber meets the road. A web of hundreds of miles of dedicated bike paths weaves through Denver and its edges. You can, for example, ride from Cherry Creek State Park in southeast Denver to Cuernavaca Park on the northwest side of downtown. The 15-mile paved path follows along Cherry Creek to where it collides with the South Platte River at Confluence Park. In spring 2010, Denver introduced a pioneering bike-sharing program called Denver B-Cycle. More than 800 new, shiny red Trek bicycles are now available for sharing at 88 stations around The Mile High City. Each of the sturdy, three-speed, bright red Trek bikes comes with a wire basket, built-in light and lock. Denver visitors can purchase passes with a credit card at any B-cycle station. Riders can pick up a B-cycle from any station and drop it off at any other station. For more information, call 720-865-BIKE. Rickshaws, pedal-cabs, bike-taxis-no matter what you call them, these mountain-bike-style tricycles pulling passenger cabs are the slickest way to get around downtown and LoDo, especially on game days. Mile High Pedicabs is the oldest fleet, starting in 1988. Drivers strive to give a good, safe ride, so most pedal for tips (or $2 per city block). Explore The Mile High City on a super-cool scooter! ScooTours Denver offers motorized, Vespa-style scooter rental and guided scooter tours. The guided tours are especially fun, as friendly scooter tour guides lead you to the best sights and tell you stories of Denver past and present. Never ridden a scooter before? No problem. If you can ride a bicycle, are 18 or older, and have a valid Driver&apos;s License, ScooTours can easily train you to ride. Denver is a delightfully walkable place. 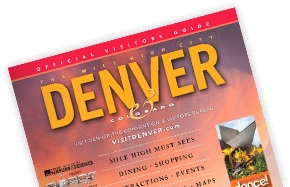 Every important city venue can be reached on foot, from the historic Brown Palace Hotel to the new award-winning Denver Art Museum (100 W. 14th Ave. Pkwy.) to the versatile Pepsi Center (1000 Chopper Cir.) City dwellers can hoof it over the Millennium Bridge connecting the bustling 16th Street Mall with the relaxing Riverfront Park in the Central Platte Valley neighborhood. Walkers can share the paths and parks that bikers use; just remember to stay to the right and listen for riders coming up behind you. It&apos;s a fun adventure for the family, a classy way to arrive at the theatre or the quintessential romantic ride; in any case, it&apos;s a delight to sit up high snuggled under a blanket in a Cinderella carriage drawn by magnificent draft horses. As you slowly clip-clop along the streets, you&apos;ll get a different perspective of the sights and lights of downtown Denver. You can customize your tour with any number of carriage drivers you find along the 16th Street Mall. No need for reservations; just approach a driver who&apos;s parked. Prices start around $50 per carriage.